Sometimes it's fun to just cook the basics. Like any other food blogger, I enjoy letting the creative juices flow, adding twists and turns to my dish making it unique and exotic. However, sometimes simple classic flavor combinations are enough. 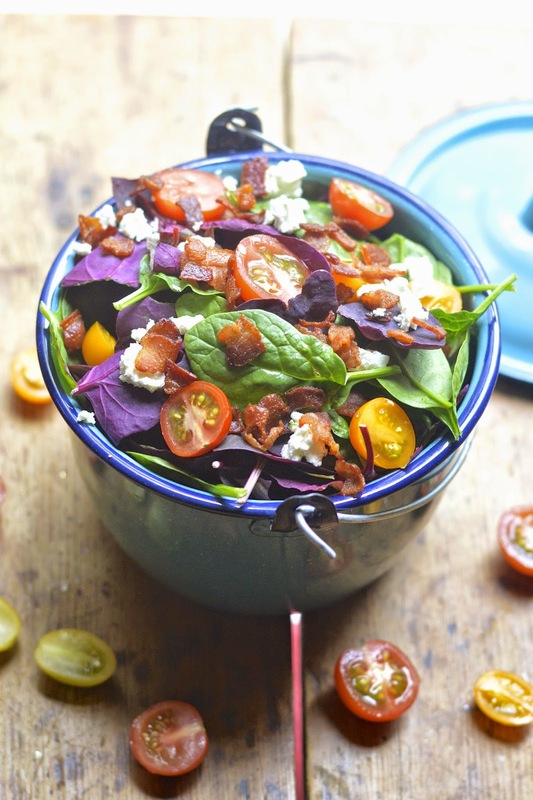 Therefore with this elegant Spinach and Bacon Salad, that is a rendition of a Craig Claiborne creation in the New York Times Cookbook (originally published in 1966), I give you the option of just sticking with the basics or jazzing it up with a bit of feta cheese and cherry tomatoes. 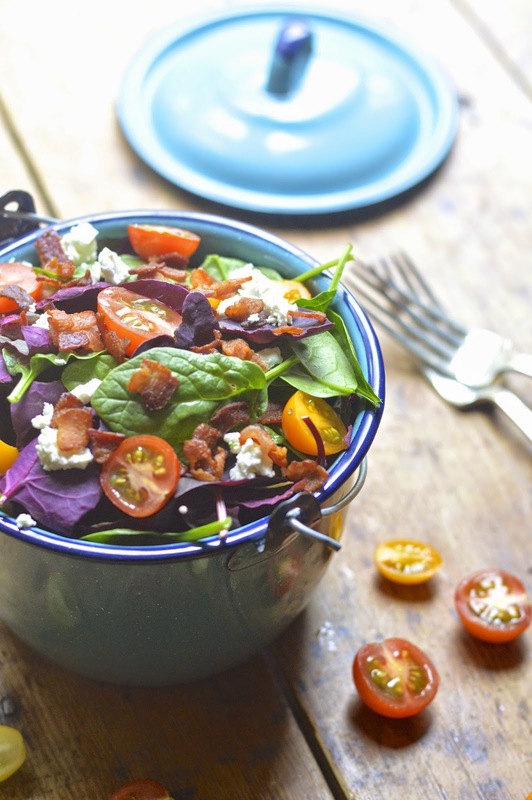 The combination of spinach and bacon is definitely enough flavor to make your salad sing. However, for photographic purposes, I wanted to add some color and texture. Plus the flavors really work. I personally can put feta cheese on anything and the sweet tomatoes are a nice contrast to the salty bacon. The colors and flavors work and I highly recommend going old school with this yummy salad. *Recipe note - I used heirloom red spinach from Trader Joe's as well as regular spinach. The color is beautiful! Whisk the vinegar, oil, mustard, garlic, salt and pepper to taste until emulsified. Cut the bacon into small pieces and fry until crisp. Drain on paper towels and then crumble it. 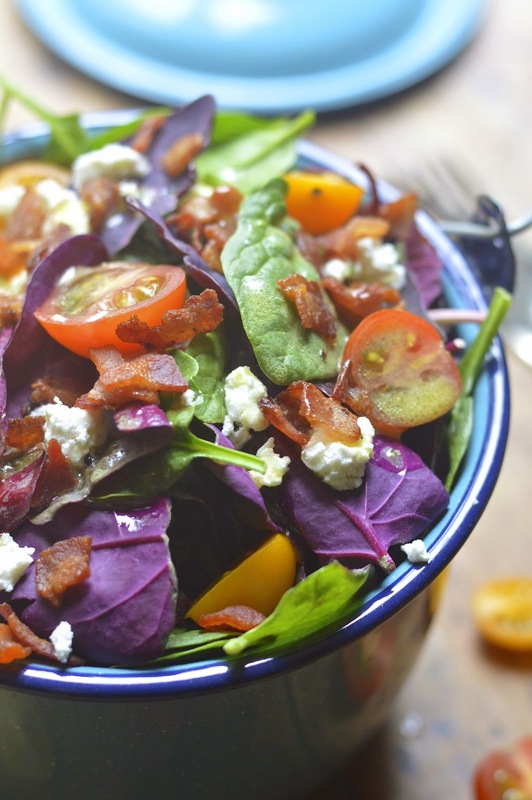 When ready to serve, toss the spinach with the dressing and sprinkle with crumbled bacon. Add cherry tomatoes and feta cheese if desired.